Developer: Flagship Co., Ltd., Nintendo Co., Ltd.
A legend begins anew... and a new multiplayer adventure is born! Take up your sword and prepare to defend Hyrule-the Super NES classic, A Link to the Past, is now on Game Boy Advance! As evil seeps across the kingdom, you must explore deep dungeons and uncover dark secrets on an epic quest to defeat the evil wizard, Agahnim. And now you can also link up and play Four Swords, the first-ever four-player Zelda adventure! Bring light to the world! Master items like the Hookshot, Power Glove and Pegasus Shoes as you warp between the massive Light and Dark Worlds on one of Link's most epic adventures. Link your Links! 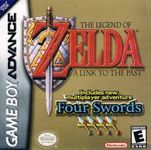 Four Swords isn't just the first multiplayer Zelda game--it's also a unique mix of competition and cooperation that'll have you and up to three friends scrambling for Rupees!